After 4 years of trying we have finally become British Champions in the F1 in schools 3D challenge for 2012. 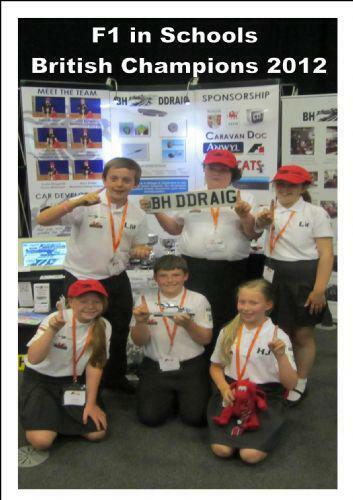 The team, called BH Ddraig, comprising of Sadie Wagstaff, Holly Jones, Max Evans, Paris Haliday, Louis Morgan and Lydia Harrison were crowned champions on the 27th June in Birmingham. Over 1000 children too part nationally and over 200 were at the British Finals. The team who had won the regional competition in Bangor in January had completely re-developed the car and portfolio in order to try and win. Max was the chief engineer and worked with Louis to make the car on Solidworks. They went to Bangor University to finalise this and watch the car be made. The team then asked Mr Weaver to help sand and paint the car to a professional finish. The girls had worked on merchandise and marketing the car. We raised over £900 by contacting and working with sponsors during the whole process. We have then sold the remaining merchandise in the school shop. During the race day they had to make two identical cars, one to race and one to be scrutinised. They also had to speak to the judges about engineering the car, and marketing the car. They then raced the car down the 20m track and were judged on speed and reaction time. Once this was completed the team stand was judged and their 20 page portfolio examined. They then had to complete an 8 minute presentation to another set of judges. Finallyy all the scores were collected and we won 'Best Verbal Presentation' and 'Overall Winners'. The children received their trophies and had photographs and camera interviews to content with afterwards. They also received a VIP trip to the British Grand Prix the following week, where they got to mingle in the paddock and meet all the F1 drivers. A day they will never forget. The school teams have come a long way since they first entered and this is the second time we have reached the British Finals. The children were a credit to school and themselves and are BRITISH CHAMPIONS!! They have had lots of sponsorship and would like to thank the following for all their support. Lets hope we continue to improve further next year.